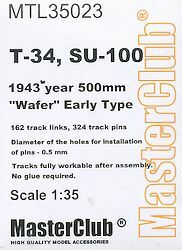 This set of individual link tracks for Masterclub is in their new metal track series and represents the 1943 UZTM 500mm “Wafer” or “Waffle” pattern depending on your terminology. The set consists of 162 cast metal track links, 81 with the guide horn and 81 without the guide horns and 324 small resin 0.5mm track pins that are designed to pin the links together without the need for gluing. 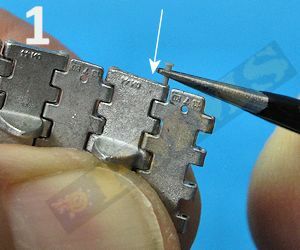 There are actually two types of track pins provided in two small plastic zip lock bags so don’t mix these up, there is the pin with rounded dome pin head for the outside of the tracks and the other with virtually no head at all for the inside of the track runs on either side of the vehicle. Each track link is cleanly cast with just a few small pour burs to be cleaned up and cast a little thinner than some contemporary links for a good scale appearance. The “waffle” pattern is very cleanly cast with the two outer holes fully open without any clean-up needed and on the inside face of the links with the guide horn are very fine casting numbers that add to the detail. Also the hollow inside the guide horn is quite deep to also give an excellent appearance. and close-up of the two types of resin track pins provided. All the track pin holes are fully drilled out with only the occasional hole needing any further drilling and a notable feature of the links is the pin holes go all the way through the links allowing you to assemble to links using lengths of wire should you prefer this to the small resin pins provided. I found this feature very useful when joining the track runs ends together when fitting to the model as it does allow you to slip out the wire pin to take the track runs off the suspension to adjust the idler position if need be for the best track sag. 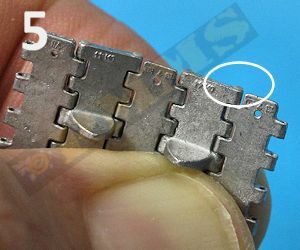 Dimensionally the links measure out to the perfect scale 500mm width (14.3mm) although there is a minor issue with the pitch (length) on the links being very fractionally short meaning you need to use 74 links to form the full track with the real vehicle using 72 links per track run. This minor difference over the full length of track is really insignificant and certainly doesn’t show with normal viewing. 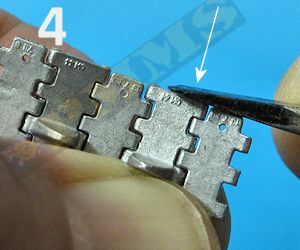 Assembly is fairly straightforward but you do need to take care fitting the resin track pins as they are designed to hold in place with friction after being “squeezed” into the link holes and there is no second chance if you break a pin during assembly. 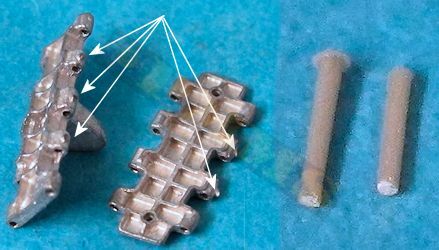 296 pins are required to assembly both track runs and as you get 324 pins there is a few to account for attrition but taking care with the assembly will reduce the number of damaged pins and if worse comes to worse there is the full width wire pin method as a fall back. The most important thing when fitting the pins is to keep them at a perfect right angle and parallel with the links as you have to exert a bit of pressure to get the pins seated all the way into the holes so they won’t come out as no glue is used. I used the following assembly method and apart for the occasional hole that needed re-drilling I only had about 6 pins snap off during assembly due to not having the pin perfectly square to the links. First fit the two links (one with guide horn and one without) together and hold firmly with your fingers (1), then using a pair of stout needle point tweezers slip the pin into hole as far as it will go till it becomes tight (2), making sure you have the pins on the correct side of the links depending if the right or left track run. 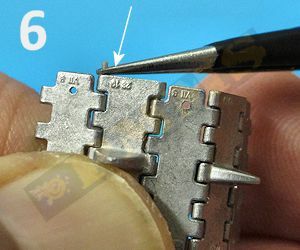 With the pin inserted as far as it will go with the tweezers then use the head of a small screwdriver to “push” the pins firmly into place until the head sits flush with the link (3, 4, 5). 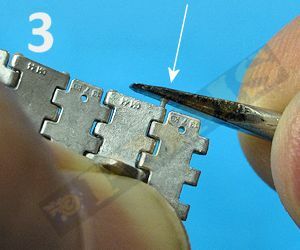 This is where it is important to exert the pushing pressure perfectly square with the links otherwise you will bend the resin pin and the only way out then is to extract or drill out the resin pin and start again with a fresh pin. 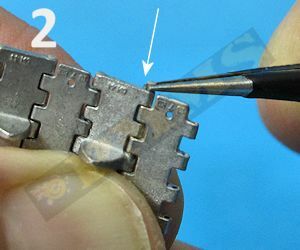 You then rotate the track and repeat this for the other side of the link to secure the two links (6, 7) and then repeat this process for the full track run making sure you have the guide pin and flat links fitted alternately. The tracks runs assembled fairly quickly using this method but again I stress you must exert the downward pressure on the pin perfectly square as you push or you will have problems, but as there is only a little over1mm of exposed pin needing to be pressed into the links there shouldn’t be problems if care is taken. The assembled track runs articulate freely and the pins hold in place very well without any glue, only about 3 or 4 pins wanted to come adrift and a small dab of cyanoacrylate on any offending pin will keep them in place. 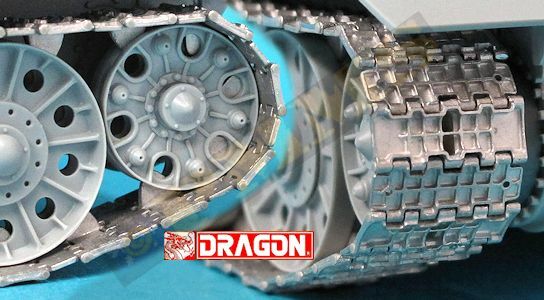 Fitting the assembled track to both the applicable AFV Club and DML T-34 kits was very straightforward although on both kits I needed to adjust the position of the idler axle/wheel to get the optimum amount of track sag for the top track run, but this was nothing overly complicated. 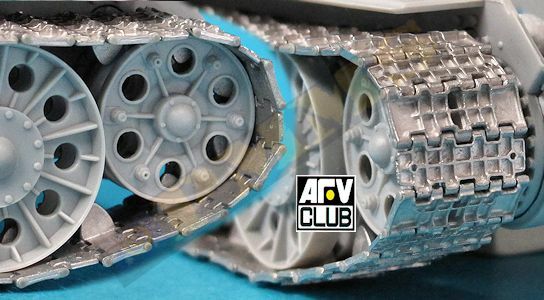 Assembled tracks test fitted to the AFV Club T-34-76 kit. Assembled tracks test fitted to the DML T-34-76 kit. 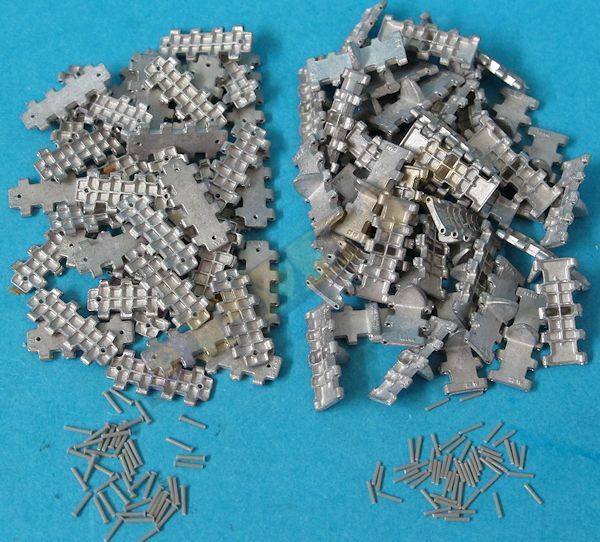 Overall this is an excellent set of 500mm T-34 Tracks that are cleanly cast with excellent link details and minimal clean-up prior to assembly. 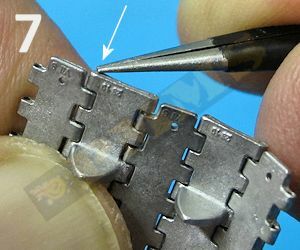 The resin pins used do require extra care during assembly to avoid damage but give a far better appearance than with simple wire pins and the possibility to use wire as a back-up gives a safety net should the pin method not be preferred? 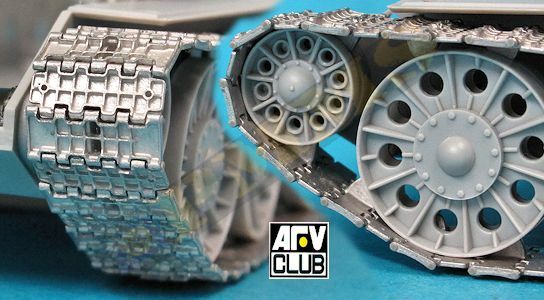 The assembled track runs articulate well and fit easily to the preferred T-34 model for a great improvement over the respective kit tracks or as an alternative track design. Thanks to MasterClub for the review Set.